Yeah, I know, but it’s too funny not to share. 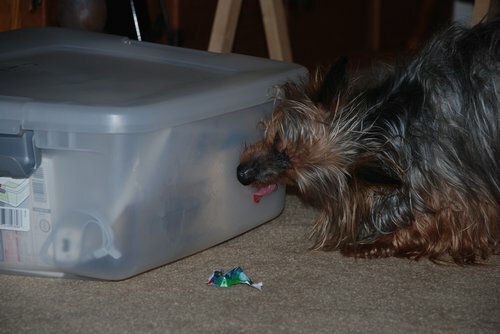 This is Hercules the Yorkie, who lives with pog’s mom. One of his hobbies is licking plastic bins. He also likes to shred wrapping paper, so you can imagine Christmas is BIG. HUGE even. That little shred of paper is left over from his earlier rampage, in which we all sat in a circle and threw the wrapping paper into the center of the room…where Herky was. At one point he got impatient for more paper to shred and started running off with someone’s unwrapped gift.